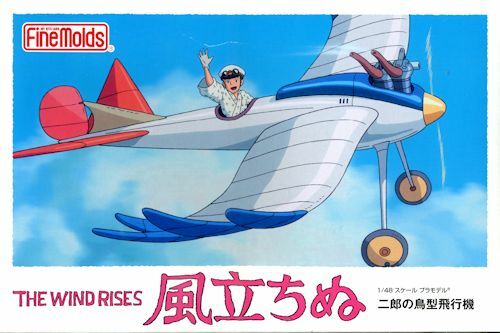 The Wind Rises (風立ちぬ Kaze Tachinu?) is a 2013 Japanese animated historical fantasy film written and directed by Hayao Miyazaki, and adapted from his own manga of the same name which was loosely based on the short story The Wind Has Risen by Tatsuo Hori, a writer, poet and translator from mid-20th century (Showa period) Japan. Kaze Tachinu is a fictionalised biography of Jiro Horikoshi, designer of the Mitsubishi A5M (featured in the movie) and its famous successor, the Mitsubishi A6M Zero. Both aircraft were used by the Empire of Japan during World War II. Miyazaki announced that this was to be his final film before retiring as a feature director. The film was released by Toho on July 20, 2013 in Japan, and will be released by Touchstone Pictures in North America on February 21, 2014. When one opens the box, one is presented with four sprues, each one of them a different color of plastic. It is pretty obvious that this is a snap kit, thanks to the large pins and sockets used to attach the very nicely molded parts. The parts are also pretty much the color of the completed model, which will be great for the youngsters who are building this. Only a few bits actually need any paint, assuming the builder does not care about seams. There is a cockpit of such that is made up of a seat, floor and control stick. A figure is provided that can be fitted once the model is complete. The wings consist of an upper and lower section with the bird feathers on the upper part. Once piece tailplanes and the wings are trapped in the fuselage halves and there is a separate upper engine cowling. On the back of this cowling piece fits the instrument panel and onto that attaches the instrument panel decal. Wheels are a single molding as are the main gear struts. Engine cylinders with molded in exhaust fit into the top of the engine cowling. The fin/rudder slots into the upper rear fuselage. A large trim wheel is attached to the fuselage side. Up front a three piece prop/spinner assembly fits into a poly cap. The rest of the kit is a display stand which is rather beefy and includes two pins that fit into holes in the bottom of the fuselage. The other decal is for the name of the aircraft and goes onto the completed stand. Instructions are very much for the home market with the majority of information in Japanese, but with some English for the painting information. 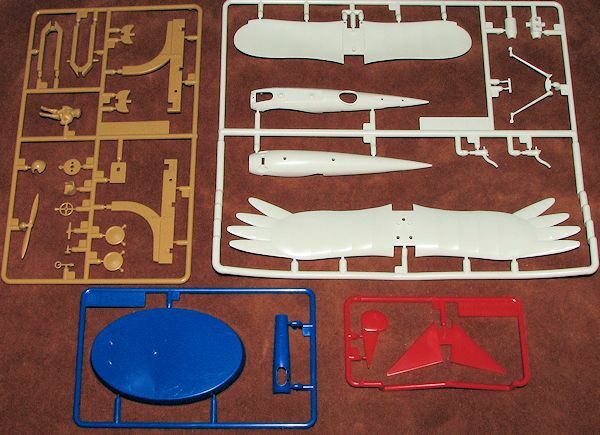 This is rather standard Fine Molds stuff as they do not make their kits for the overseas market. I do not doubt that this kit will eventually find its way into the US market, though when is unknown as is the price the importers and distributors will charge. I assure you it will not be $22, which is the current exchange rate. It is a must for the Miyazaki fan or those who enjoy building off-beat movie models. Thanks to Kevin Dolin for sending me the preview kit.